Carrier’s standard bag flattener systems quickly flatten bottom-heavy, irregular-shaped bags and convey to a palletizing area. With an easy-to-install design and proven performance, our bag flatteners provide efficient operations with little maintenance requirements. 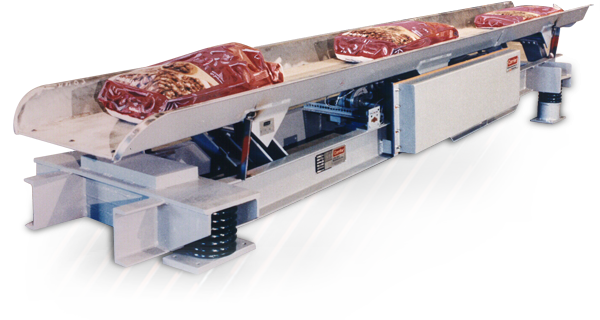 Our bag flattener systems feature removable and adjustable angle levels to effectively flatten different bagged products. Maximum bag size: 24 inches wide x 31 inches long x 7 inches high. Removable and adjustable leveling angles for better control of different bagged products. 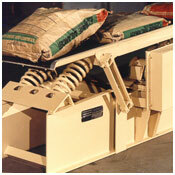 “Ruff-Top” liner prevents bag damage; no bag tearing or pinching. Fines scalping section for removal of loose dirt and debris. Heavy duty, natural frequency bag flattener unit precisely tuned to specific stroke, frequency, and angle of incline to flatten and convey bagged bulk solids. Our bag flatteners are proven to provide easy installation, low maintenance and minimum downtime.